You are welcome to custom order ANY of our maps in the large 24x30 wall size. Just let us know exactly which map or maps that you would like to have in this size in the comments section when you check out with your shopping cart. 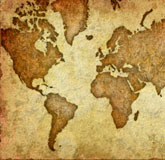 You may reference maps by book and page number or simply select our most popular maps below. Only $7.95! Maps are not laminated as the costs of lamination have gone through the roof. You are certainly free to laminate your maps once you receive them.